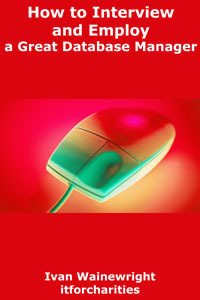 I am publishing today a free eBook called "How to Interview and Employ a Great Database Manager". But I am using the "pay with a tweet" concept for the first time so my thanks in advance for helping me try that out! Just click on the following button to download - don't worry, it only takes a few seconds. I have helped a number of charities interview and employ new Database Managers. The first time I did it, two things hit me: first, I was quite surprised at how I, as a “database person”, really could tell if someone else was also a “database person”. I found that if I asked the right questions, dug a bit deeper where necessary and gave an interviewee a chance to express themselves, then I could soon tell if someone did have the experience or the potential to be a Database Manager. The second thing I learned straight away was that just because someone has the skills to be a Database Manager, it doesn’t mean they will necessarily fit in with your team or your organisation. In fact, the very first time I helped a charity with their interviews, after the first candidate which I liked, the Development Director told me that it didn’t matter how good that individual was, they simply wouldn’t work well with his team. So, everything I discuss in this book has that significant caveat to it: I will try to show you what a great Database Manager looks like and how you might be able to employ one, but everything else which you would normally do when interviewing anyone for any post – from sifting through resumes and CVs through to agreeing a salary which your charity can afford - still holds just as true as ever! This book is intended for people who work for charities who need to employ a database manager. You could be an existing Database Manager looking for an assistant, a Fundraising or Membership Manager who needs someone to look after their database, or an Operations Manager who needs a new Database Manager and so on. You do not need to be a technical person to apply many of the ideas in the book, although there is no point in denying that it might well be difficult for you to fully decide if someone is a good Database Manager if you cannot understand some of their slightly more technical responses to your interview questions. In which case, having someone on hand who can offer advise on that can be a great help; very often, the outgoing incumbent can be an option or someone from your IT staff; and I know other charities who have used trustees, other technical staff from their charity, or a manager from another charity even; and of course consultants like myself can help with the whole process. Because I am writing it for charities and nonprofit organisations, there is a slant in some parts of the book towards fundraising and membership because such areas are so central to nonprofit organisations. But you should be able to use it just as successfully for any Database Manager you want to employ in your charity.